I thought this was okay. 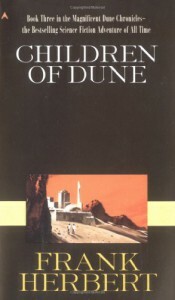 I didn't enjoy it as much as Dune and Dune Messiah. It could be because I found the absence of Paul as a primary character makes a difference. The focus on Alia and Jessica and others battling for control of Paul's children dragged for me. Anyway, I finished the trilogy, and that's one tick off the bucket list.